[DERB341] Walkelin of Ferrieres m. ? [DERB341] Walkelin de Ferrieres was a Norman "Gualcheline". He was slain in the civil wars which distracted Normandy during the minority of DUKE WILLIAM (1040). [DERB351] Henry de Ferrieres (son of Walkelin), Sire of Ferrieres & Chambrais in Normandy, married Bertha. He was one of the Domesday Commissioners, and was also a great land-holder, with land in Berks, Bucks, Derbys, Essex, Gloucs, Herefords, Leics, Lincs, Northants, Notts, Warks and Wilts. 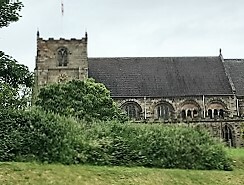 The land in Derbyshire included, for example, Etwall where the present church shows traces of Saxon stone-work from an earlier church. Henry died at Tutbury (?1101) and was buried in Tutbury Benedictine Priory which he had founded. [DERB361] Robert de Ferrieres (3rd son of Henry) married [VITR362] Hawise (daughter of Seigneur Andre, see VITRE). He was created 1st Earl of Derby (1138) by King Stephen as a reward for his services as one of the commanders at the Battle of the Standard, at Cowton Moor, north of Northallerton, (22nd August 1138). He died 1139. [DERB374] Isabel (daughter of Robert) married [CAUX431] Robert II de Caux (see CAUX). [DERB371] Robert de Ferrieres (2nd son of Robert) married [PEVE372] Margaret (see PEVEREL (2)) and part of her dowry included the town of Uttokeshather (later Utoc Cestre, Utcester, Uttoxeter) on the borders of Needwood Forest, together with the townships of Crakemarsh, Creighton, Stramshall and Woodlands. Robert became Earl of Ferrieres, then 2nd Earl of Derby (1139). He died before 1160. [DERB381] William de Ferrieres (son of Robert) became Earl of Ferrieres, then 3rd Earl of Derby (by 1160). He was one of the adherents of the "younger Henry" on his rebellion (April 1173), and sacked and burned Nottingham (c. May-June 1174). He founded the stone castle at Tutbury, though little of the original structure remains. He also rebuilt in stone Duffield Castle of which very little remains following its destruction after the Battle of Chesterfield (in 1269). William [allegedly] married [ABER372] Sibyl (see ABERGAVENNY (BRIOUZE) BARONY). He died on a Crusade at the Siege of Acre, Palestine (c. October 1190). Afterwards Sibyl married 2. Adam de Port, Lord of Basing, who died 1213. The charter being the sole evidence for the marriage of this Earl William, it now does not appear whom he did marry. [DERB392] Pernell (daughter of 3rd Earl) married [STAF471] Hervey (see STAFFORD BARONY). [DERB393] Millisent (daughter of 3rd Earl) married [MORT459] Roger (see WIGMORE (MORTIMER) BARONY). [DERB394] Maud (daughter of 3rd Earl) married [VIVO471] William de Fortibus (see FORTIBUS). [DERB395] Walkelin de Ferrieres (son of Robert), feudal Lord of Eggington, is dealt with under EGGINGTON). [DERB391] William de Ferrieres (son of 3rd Earl) became Earl of Ferrieres, then 4th Earl of Derby (1190). He married (1192) [BAYE384] Agnes/Alice (see CHESTER (BAYEUX) EARLDOM). William was present at the Siege of Lincoln Castle (20th May 1217). He then commanded the royal forces which took and razed Mountsorrel Castle (1217). He went on the Fifth Crusade (June 1218), and then accompanied King Henry III in the expedition to Brittany and Poitou (from April - October 1230). He died of the gout (22nd September 1247). Agnes died shortly afterwards (2nd November 1247). [DERB402] William de Ferrers (son of 4th Earl) married 1. Sibyl (3rd daughter of Earl William, see PEMBROKE (MARSHAL) EARLDOM); then 2. (c.1238) [QUEN402] Margaret (see WINCHESTER (QUENCY) EARLDOM). William accompanied the King to France (April 1230), was Constable of Bolsover Castle (1234-36), and became 5th Earl of Derby (1247). On passing over a bridge at St. Neots he was accidentally thrown from the litter (which he habitually used having been afflicted with gout since his youth) and sustained injuries from which he never recovered. He died at Evington, near Leicester, (March 1254). Margaret died c. March 1280-81. [DERB413] Joan de Ferrers (daughter of 5th Earl & Margaret) married [HARD481] Lord Thomas (see BERKELEY BARONY). [DERB411] William de Ferrers (son of William & Margaret), of Groby, married 1. [DESP484] Anne (daughter of Sir Hugh le Despenser of Ryhall); then 2. [LOUZ413] Eleanor Louvain (born 1268, daughter of Mathew, see LOUVAIN Second Line). After William's death, Eleanor married 2. [DOUG481] Sir William Douglas (see DOUGLAS EARLDOM). Another source say William (younger son of William died 1287] by his 2nd wife Margaret de Quency) married [DURW454] Anne Durward as her second husband (widow of Colban Earl of Fife), see DURWARD. [DERB422] Anne de Ferrers (daughter of William & Anne) (allegedly) married [GREY491] Lord John de Grey of Wilton (see WILTON (GREY) BARONY).